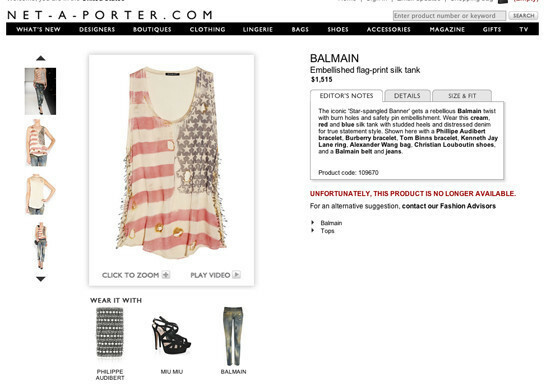 We're no strangers to Balmain's wares -- t-shirts ripe with rips and bleach stains with price tags reading in the thousands of dollars -- but one tank top in particular has some fashionistas and patriots alike fuming. 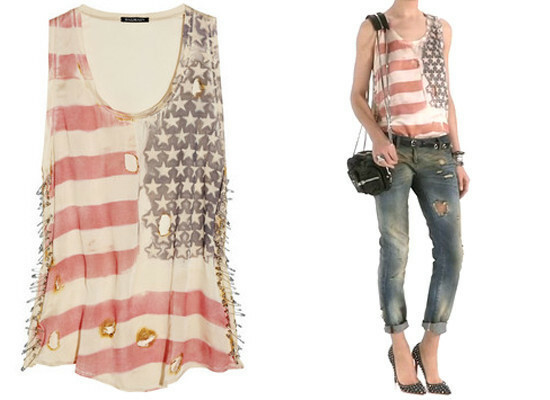 Presenting the "Embellished flag-print silk tank," a starred and striped shirt punctuated by burn holes and attached at the seams with safety pins. Yours for only $1,515, or it could have been, but it's currently sold out on Net-A-Porter.com. Celebs like Ke$ha and Kate Bosworth have recently been spotted in knockoffs of the number and similar styles have been stocked at Forever 21 and Topshop. Retired Army soldier George Alatzas heard about spring's bestseller and told the New York Post, "I think it is a disgrace for a Frenchman or anyone else to desecrate the American flag. Our flag has witnessed many sacrifices. It is the glue that holds our patriotism together. Shame on those who defile it in any way." For us, the most upsetting bit is the four-digit fee to, essentially, look like you were in a freak fire on the Fourth of July. What do you think?